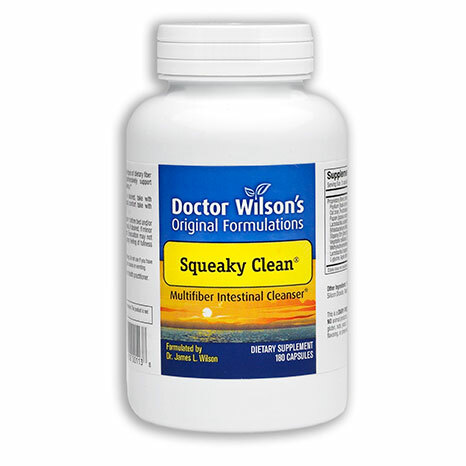 Dr. Wilson’s Squeaky Clean is a gentle & complete natural multi-fiber intestinal cleanser, detoxifier and conditioner. Healthy intestinal function and a balanced intestinal environment are essential to your overall health and proper immune function, but a variety of lifestyle factors can make this difficult to maintain. Squeaky Clean™ brings together into one carefully balanced product a complete range of natural ingredients that work together to promote and revitalise optimal intestinal function while supporting overall intestinal health. 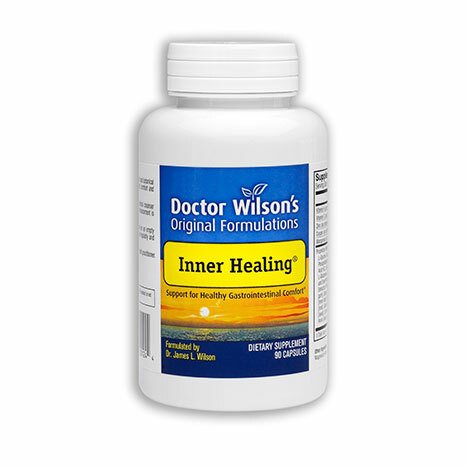 Dr. Wilson’s unique formula contains 8 different types of dietary fiber, 3 strains of probiotics, 5 herbs, and proteolytic enzymes that all work together to help thoroughly clean your intestinal tract, promote regularity and effective evacuation of waste and toxins, soothe and condition your intestinal linings, and maintain a healthy balance of intestinal flora. Squeaky Clean™ gently promotes a healthy intestinal environment for normal function and nutrient absorption without dependency – all in easy to take vegetarian capsules.We love this product because it removes the need for multiple products to maintain and improve the bowel function and we have had exceptional feedback about its ability to regulate and improve the gut function.Over his years in practice Dr. Wilson saw that people often had to take a variety of several different intestinal products to aid digestion and elimination, promote normal bowel action, cleanse and detoxify the intestinal tract, and establish healthy intestinal flora. To create a better solution, he formulated Squeaky Clean™ to meet all of these needs with just one easy-to-use product. 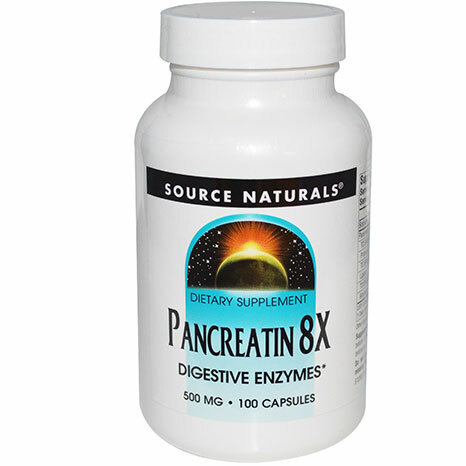 After selecting a full range of the special ingredients he found to be most effective, he blended them in proportions that work together to optimally support all of these various aspects of intestinal health and function. The result is a reliably effective, economical, convenient, and easy-to-use product with gentle, thorough and uniquely comprehensive action. 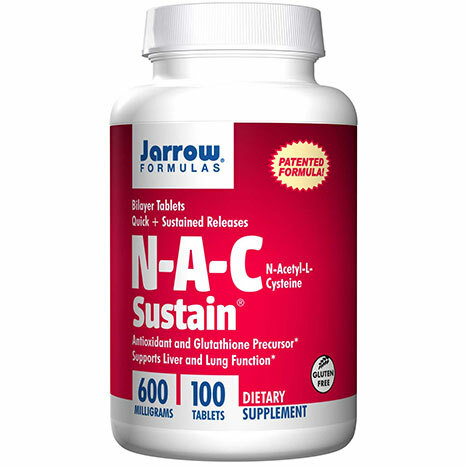 This outstanding formula has many uses: to help promote natural regularity, as a safe and low glycemic source of complete dietary fiber, to facilitate detoxification, to help rebalance the intestinal flora, as an aid during fasting to help avoid reabsorbing the toxins being eliminated, to promote proper bowel function while traveling, and to soothe intestinal linings and facilitate complete evacuation after a substandard meal. Squeaky Clean™ is not habit forming and can be used daily or occasionally as needed. Squeaky Clean™ promotes natural regularity but it is not a laxative. Its multifaceted, synergistic actions provide a much more comprehensive intestinal support than is possible with simple high fiber products. The dietary fibers in Squeaky Clean™ include water soluble and insoluble fibers that, together, act like a gentle but thorough inner scrubbing brush. Insoluble fibers bulk up and soften stools to move waste through your colon more rapidly, helping prevent occasional constipation. Soluble fibers are sticky and help remove toxic waste and corrosive by-products of digestion that can cause occasional gas, bloating, and discomfort. Each of the 8 different types of fiber in Squeaky Clean™ has its own unique shape, size and mode of removing debris from every part of your intestinal tract. The small fibers are the right size to get down deep into the tiny micro-villi and brush borders of your small intestines. The medium sized fibers can fit between the villi and remove waste accumulating there. The larger fibers help move waste matter and the debris the other fibers have collected along your intestinal tract and through your bowel for complete evacuation. Research suggests that fiber may help promote colon and heart health, and help maintain healthy levels of cholesterol and blood sugar, as well as support intestinal function. Papaya enzymes are used to promote complete digestion of proteins to help maintain a healthy intestinal environment, and their proteolytic action helps break through the tenacious mucus strands that hold debris to cell walls and to the small finger-like villi and micro-villi of your intestinal walls. The micro-villi and brush border are where most nutrients (vitamins and minerals) are absorbed by your body. The combined action of the proteolytic enzymes with the various fibers helps remove mucus build-up and other debris that can interfere with absorption of nutrients. Five carefully selected herbs help gently facilitate normal peristalsis, soothe and condition your intestinal linings, and support the normal integrity of intestinal walls that allows them to absorb nutrients while blocking absorption of most toxins and allergens. When any fiber, bulking or laxative product is used, the friendly intestinal bacteria need to be replaced to maintain optimal gut integrity. Squeaky Clean™ delivers 3 of the most important strains of friendly bacteria (probiotics) known to enhance healthy intestinal balance, plus the nutrients that help them thrive. All these actions together help support and protect many aspects of intestinal function and health, including healthy digestion, intestinal wall integrity, maximum absorption of nutrients, effective elimination of toxins, and regular complete evacuation. When you try Squeaky Clean™ we will be very surprised if you don’t notice the difference. This product has become a firm favorite amongst practitioners who specialise in colonic irrigation, detoxification and general bowel cleansing and restoration. For optimal results, take this product along with Dr. Wilson’s Inner Healing™. A proprietary formula in cellulose (vegetable source) capsules containing: organic pysllium seed and husks†, brown rice husks and bran, oat bran, plantago, bentonite, vegetable cellulose, papaya enzymes, Lactobacillus acidophilus, Bifidobacterium infantus, hemicellulose, slippery elm, prune concentrate, ginger, fenugreek, fructooligosaccharides (FOS), and Lactobacillus bulgaricus in a base of apple cider vinegar and betaine hydrochloride. Vegetarian (Vegan) Formula, contains no animal products. 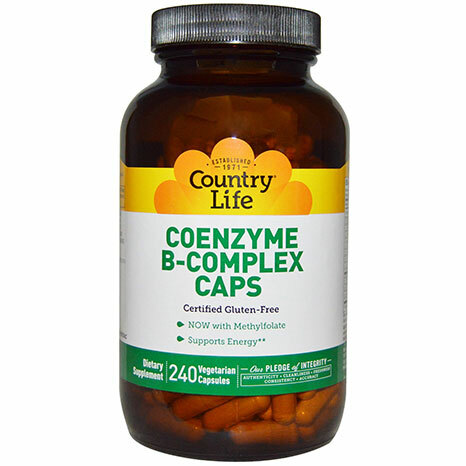 Adults and children 12 years of age and over take between 1-3 capsules (or pull capsule apart and rapidly blend contents) with 250ml of juice or water, followed by an additional 250ml glass of water. 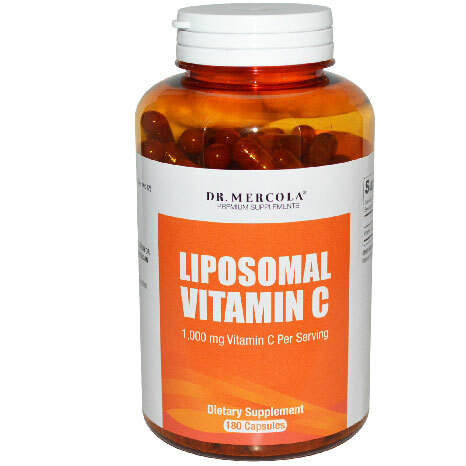 Take before bed and/or upon rising at least ½ hour before or 2 hours after eating. If minor bloating or gas occurs, try temporarily decreasing amount. It is best to drink several additional glasses of water throughout the day to facilitate healthy intestinal function. This formula works gently with the natural processes of elimination, and evacuations may not occur until 24-72 hours after first taking it. As a result, some people may experience a temporary feeling of fullness. When the intestines are detoxifying it is common for eliminations to contain putrefactive strings, solid particles and ropey mucus strands. 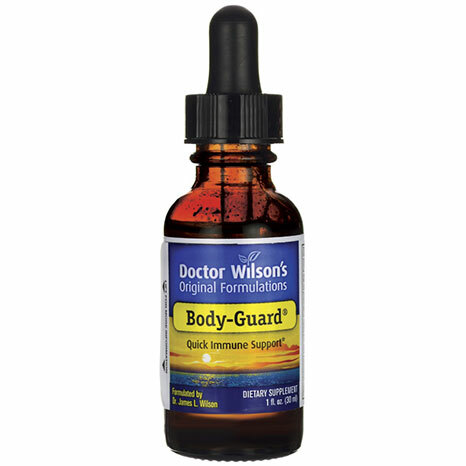 To enhance immune activity when occasional intestinal imbalances occur, take Squeaky Clean™ with Dr. Wilson’s Body Guard™. Squeaky Clean can also be used successfully in conjunction with Dr. Wilson’s Inner Healing™ particularly when food allergies or “leaky gut” is present. For best results, this supplement should be taken with at least a full glass of liquid.